It’s taken years, but I finally feel like I have a handle on my skincare routine. I’ve gotten to the point where I understand my skin so much more and am finally picking the correct products for my skin type. Turns out, my skin is actually pretty dry, but I’m prone to breakouts, too. So for years, I was using harsh anti-acne products that were stripping my skin dry, which was making my skin actually produce more oil and adding to the problem. Not good. It seemed counter-intuitive to me at first, but moisturizing (and moisturizing often!) was actually the solution to my skin woes! Taking care of my skin is probably my #1 beauty priority. I’m kind of obsessive about doing masks every week, making sure I wash my face minutes after a sweaty workout, and moisturizing like crazy. Especially when I travel, I really make sure to take care of my skin. Different climates and temperatures can take their toll, so I’m always trying to stay one step ahead. As much as I love a routine, experimenting with new beauty products is one of my favorite aspects of running Bows & Sequins. 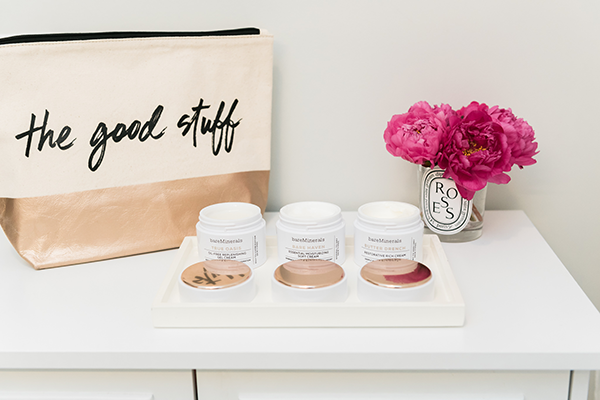 My skin can be super sensitive at times, so I won’t try anything, but I do love testing new products and finding those gems that I’ll have in my medicine cabinet forever. I’ve found some of my most favorite products from friend recommendations, as well as skincare events. So I hope that my reviews and recommendations can help you find some favorites, too! I actually share a lot more beauty-related things on Snapchat so if you’re interested, follow along there for more real-time beauty updates. My username is jessicasturdy. Last winter, I fell in love with their Complexion Rescue foundation and I’m still using it over a year later. Remember this post? I love how it was ultra-moisturizing and was makeup with a skincare focus. So back-track to this past December when I heard that Bare Minerals was launching a new skincare line, Skinsorials… I was immediately interested in seeing what they had come up with! So for the last few weeks, I’ve been trying out all four of the cleansers, their new SkinLongevity serum, and three of the four moisturizers. 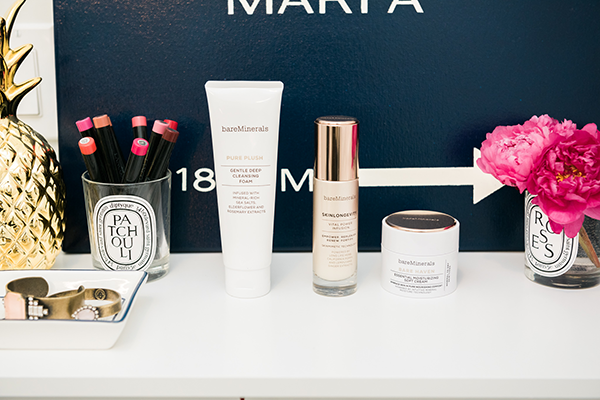 I’ll give you my run-down on each product, and then tell you my favorites! Let’s start with Step 1 — Cleanse. 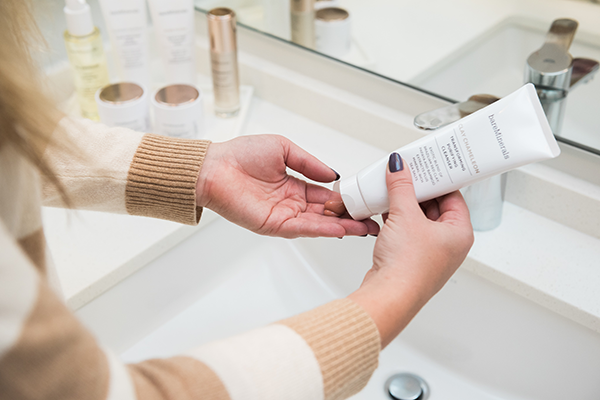 There are four cleansers in the Skinsorials line – Pure Plush, Clay Chameleon, Blemish Remedy, and Oil Obsessed. Pure Plush is a “gentle, deep cleansing foam.” But it’s not your typical liquid-to-foam cleanser, which is kind of what I was picturing from the description. It’s a creamy cleanser that suds up really well to create a foamy lather. The first time I used this cleanser, I got nervous that it was overly stripping my skin. I got a bit of that “squeaky clean” feeling when I was using it, but once I rinsed it off, my skin was super soft and felt really clean, but definitely not tight and dry like I was worried about. It’s really gentle, like the description suggests. The grapefruit scent is an added bonus! Clay Chameleon is a “transforming, purifying cleanser.” Before I even used this product, I knew I would love it. You apply the light red clay to dry skin, just like you would a mask. Once you’ve applied it all over, wet your fingertips and continue to rub. It will turn into white lather and then you rinse. I love the mask-like properties and I love how it’s super gentle, I’ve never once felt dry after using it. Blemish Remedy is an “acne treatment gelée cleanser.” I shockingly didn’t have any breakouts when I tested it, but it does contain a slight amount of salicylic acid to treat blemishes. I do think this cleanser is more for treatment, versus prevention. Sometimes I like to use a salicylic cleanser after a super-sweaty workout to make sure breakouts don’t pop-up, and this cleanser definitely fits the bill. I’ll be keeping it in my bathroom cabinet for one of those days that I wake up with a pimple or two. Oil Obsessed is a “total cleansing oil.” I jumped on the oil bandwagon about two years ago and my skin has been infinitely better since. I used to steer clear from oil products because, you know, breakouts. But my skin has really cleared up since I began incorporating oils (via cleaners, serums, and moisturizers) into my routine. This cleanser removes makeup (and it gentle enough to rub onto your eye shadow and eye lashes, I’ve tried it!) and is ultra-hydrating, without feeling greasy at all. The smell is really luxurious, too! It’s hard for me to narrow down my favorite cleanser out of the bunch, but I think Clay Chameleon and Oil Obsessed have to be my favorites. I’m a sucker for masks and I love oil products, so I’ve been reaching for these two the most! Now, Step 2 – a Serum to Enhance! 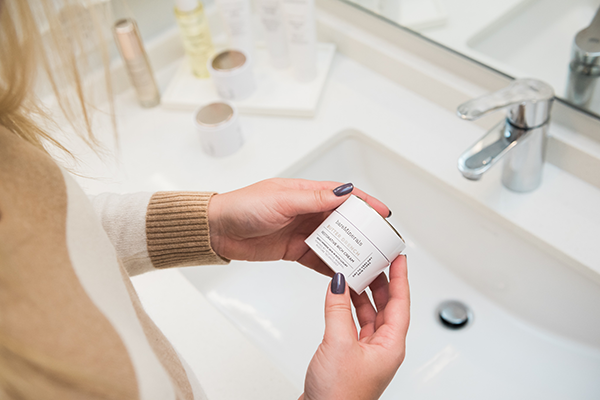 There’s only one product for this step in the entire Skinsorials collection … SkinLongevity! One is really all you need. 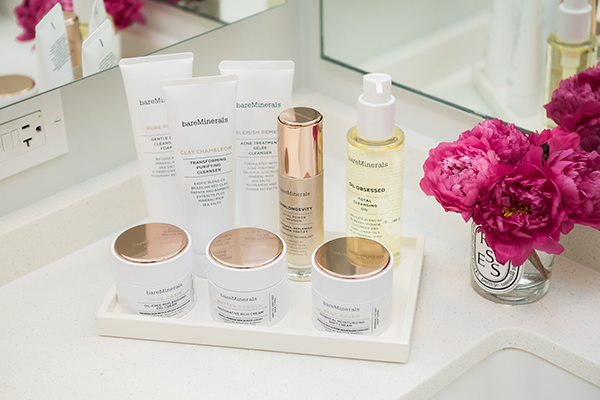 Bare Minerals did a clinical study and 90% of women who tried SkinLongevity feel it enhanced the healthy look and feel of their skin. 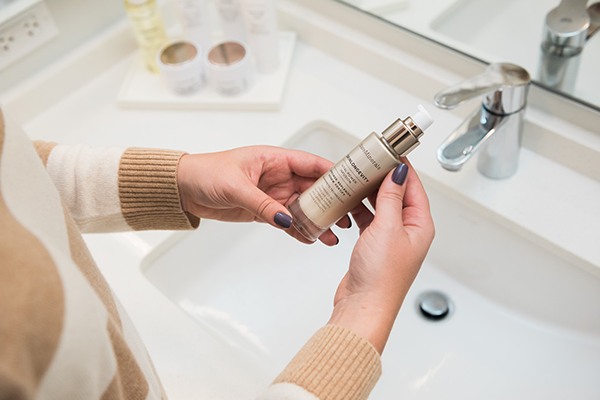 It’s a super lightweight serum that you apply after cleansing, before you moisturize. The bottle says to use two pumps, but 1 or 1.5 has been the perfect amount for me. I’m not going to get into the scientifics of the product, because I would just be regurgitating the info on the website. But if you’re into the clinicals and ingredients, like I am, it’s worth taking a look. Super interesting! And on to Step 3 – Moisturize! 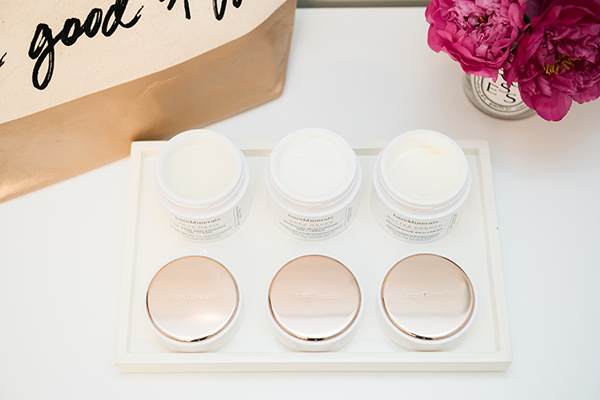 The Skinsorials collection is made up of four moisturizers – True Oasis, Smart Combination, Bare Haven, and Butter Drench. I was sent three of the four moisturizers, so I haven’t gotten a chance to try Smart Combination yet. You can find it here to read about it on your own! True Oasis is “an oil free replenishing gel cream.” It’s incredibly lightweight, but does provide enough moisture that my typically dry skin doesn’t feel dry within an hour, which is a problem I face with a lot of lightweight moisturizers. For me, this moisturizer is best for when I wash my face before heading to a workout. I don’t like to slather on a thick moisturizer before sweating, so this has been the perfect compromise. The jar says it’s for Oily to Combination skin types. Bare Haven is an “essential moisturizing soft cream.” For me, this is your go-to everyday moisturizer. Not too light, not too heavy. It’s great for moisturizing before you put on your makeup. It’s for Normal to Dry skin types. Butter Drench is a “restorative rich cream.” I can’t get enough of this stuff! Like, truly obsessed. I was worried that it would be too thick for me, but my skin has been SO DRY this winter and this cream has been a godsend. After spending a long weekend in Aspen and returning to a deep freeze in Chicago, I’ve been using Butter Drench day and night. If you have notoriously dry skin, I would highly recommend this. The jar says it’s for Dry to Very Dry skin types. If you typically use a lighter moisturizer during the day, and like a heavier moisturizer at night, this would be the perfect night cream! Now, my favorite moisturizer? Honestly, all three will be in heavy rotation. If I had to choose just one, it would be Butter Drench, but that’s really dependent upon the season. It’s my go-to right now, but I know that I’ll reach for Bare Haven instead once it’s warm out again and not so dry. True Oasis is my go-to for when I wake up and wash my face before I’m heading to the gym. Or if I’m working out after I’ve put on makeup for the day, I always wash my face and wash off the makeup beforehand. This is the perfect lightweight moisturizer that won’t clog your pores when you’re getting sweaty. You can find the new Bare Minerals Skinsorials line at Nordstrom, Sephora, Ulta, and on BareEscentuals.com! I love repurposing the old candles into holders! Thank you for your thorough review and recommendations! I am looking for skin care products, and this post was incredibly helpful, especially since I already like their very light foundation! Do you have a toner you prefer? 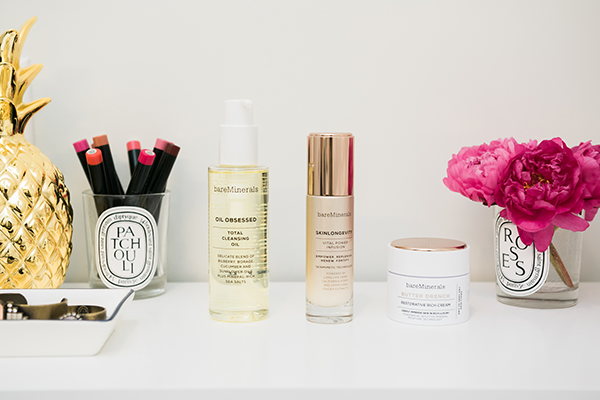 I find that my skin really needs toner–I’m using and loving First Aid Beauty facial radiance toner pads right now. For what it’s worth/a general FYI, I also LOVE Pericone, and my mother has used almost nothing else for the past 10-15 years and she looks almost the same as she does in her wedding photos from 32 years ago. Expensive line, but great product, especially once you’re really concentrating on anti-aging benefits. Anyway, thanks again! Awesome post! I have combination skin and I am wondering if some of my breakouts are due to dryness as well! My skin is not really oily but I do live in Las Vegas, which is obviously a very dry climate. Thanks for the tips! Please tell us how long you were testing these products for? for someone who seems to be her so closely–blog posts, snapchat, etc–you seem to harbor a lot of animosity towards her and the content she shares. maybe if you don’t like what you see you can make a conscious decision to avoid it rather than continue to watch and read only to leave rude and unecessarily aggressive *anonymous* comments. just a thought. My comment isn’t particularly aggressive or rude or mean. I am asking a few reasonable questions about her post. The two questions I asked above are very reasonable and if answered would help inform any of her readers. As for the snapchat – no one should be snapchatting and driving. And if my asking about it prompts her to not do it again then I will take that as a good job done Whatever need to be said can wait until you car has stopped moving. – and Jordan. You are just an anonymous as I am – and I don’t comment that often. As such I would reverse your logic and ask you why you feel it necessary to pick on a reader who is only asking some reasonable questions and showing concern for the writer. I’m so impressed with the packaging, I honestly think that alone would lure me into trying their products, lol, but also because I love Bare Minerals. I’m glad I came across this post, I’ve been searching high and low for new skincare products. Can’t wait to try these! These products sound great! I love Bare Minerals, I have a couple of their lipsticks & they’re fab! 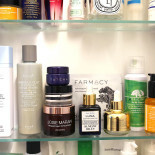 I thoroughly enjoyed this comprehensive look at skin care. It has made me reevaluate some of my skin care routine insomuch as I am considering tweaking it to get a better result (hopefully). I’m really intrigued by their new products! Also, where did you get your cute makeup bag? LOVE! I have the same skin concerns! I used to blot and strip my oily skin with everything under the sun until I had the same revelation. Love that this line seems to be a winner! I cannot wait to try this line! I have been wanting to find a skin routine and actually making it a priority! LOVE IT! I’ll have to try these out!